This morning I was pretty busy and did not get around to making a pie until about 2 PM. As I was cutting the fruit and rolling the crust I wondered, once again, who’s pie is this? After I placed the pie in the oven, I sat down to check my email and found a message from a friend asking “Do you take requests?” She mentioned that her Uncle Charlie was housebound and she thought that he would really appreciate a pie – and she also told me where he lived. I now knew the pie’s destination. Don’t you just love how these pie “questions” get answered? Late this afternoon, I arrived at the house where Charlie is now living. 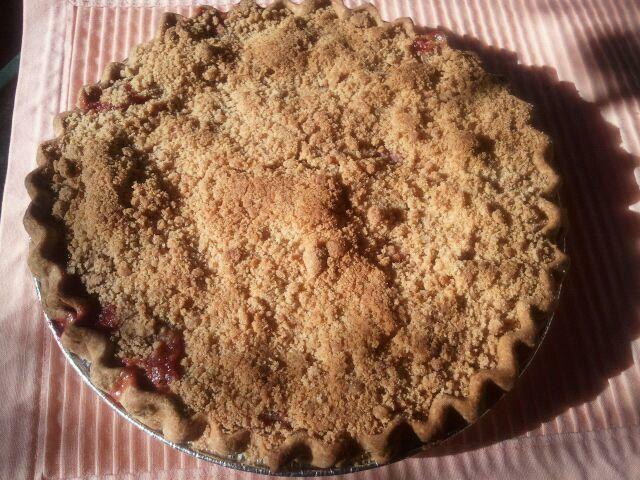 I introduced myself to his caregiver and told her that I had made Charlie a Strawberry Raspberry Rhubarb Pie. She thanked me and then brought me in to see Charlie. After a brief introduction, Charlie and I settled in for a visit. Charlie also told me about how he went into business with a man “on a handshake.” He commented on how “that’s not how they do things nowadays.” He also mentioned that he’d told someone that he was interested in buying her property “when she was ready to sell.” Twenty five years later, when she was ready to sell, others showed interest in buying the property. All of those “others” were told “It’s already been sold.” That was back at a time when people gave their word and it really meant something. I am very glad that I was able to visit with Charlie and it was great fun to hear his stories. I hope that I get the chance to visit with him again soon. It’s nice to visit the past when you have someone to show you around who has been there. What a wonderful surprise for a wonderful gentleman! “Uncle Charlie” was my Dad – Charlie. He went home to the Lord yesterday (August 10th) Before he got to where he couldn’t speak very well, he told me how much he enjoyed the strawberry rhubarb pie, but I thought it was something that the home had baked for him. When I found out differently, I wanted to let you know how much he enjoyed it! He also loved to have people visit him and ask about his life. The gift of time and caring is a most precious gift indeed. Thank you for sharing it with our Dad.